Dr. Petropoulos believes that your face should reveal your energy and optimism – not your age. She is a board-certified facial plastic surgeon and otolaryngologist (head/neck surgeon) who has the specialized training and years of experience to enhance your inherent beauty and reverse the evidence of time. While Dr. Petropoulos advocates performing non-surgical facial rejuvenation treatments when possible, many patients who visit her practice near Boston require facial plastic surgery. » Facelifts soften signs of aging on the cheeks, jaw line, and neck while retaining your natural beauty. » Brow lifts smooth out forehead wrinkles and lift heavy, droopy brows back to their original position to help you look rested and approachable. » Eyelid lifts can give you a refreshed appearance by correcting saggy upper eyelids and baggy lower eyelids. » Rhinoplasty balances the size and shape of the nose with the other facial features and can also correct breathing difficulties. 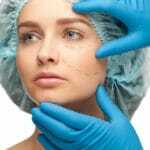 » Liposuction can give you firm facial contours and a sculpted neck. Your beauty is a top priority for Dr. Petropoulos. She will help you determine the treatment plan that will help you attain the improvements you desire with the recovery period you can afford. In addition to, or instead of facial plastic surgery she may recommend non-surgical treatments such as BOTOX® Cosmetic, injectable fillers, Fraxel®, or Thermage® to achieve your cosmetic goals. If you are ready to find out more about facial plastic surgery, request a consultation online with Dr. Petropoulos or call her at 978-739-9500.